An annual opera festival at the home of Carphone Warehouse founder David Ross is under way in Leicestershire. This year, the Nevill Holt Opera features La Boheme and Turn of the Screw. Mr Ross's 17th Century home, near Market Harborough, has its own 350 seat theatre, which is open to the public once a year to showcase the work of "young British talent". On the VIP opening night of the exhibition at Djanogly Art Gallery we caught up with David Ross and friends to find out where his interest in art started, what his first purchases were and what it's like to see the works on display in a gallery rather than at his home. Curator Neil Walker also gives us an insight into the works themselves and what he's learned about David's taste in artwork. 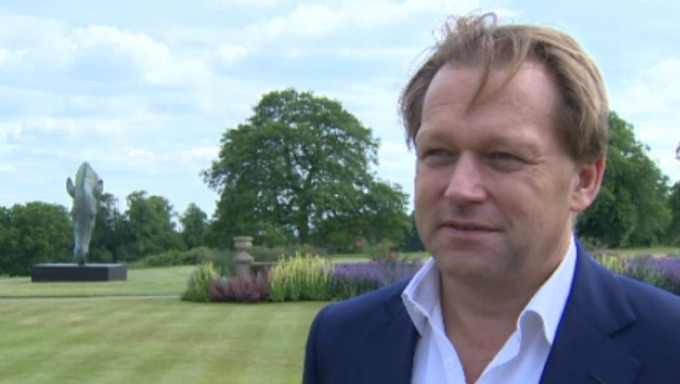 ITV Central News spoke to David Ross, one of the co-owners of the Carphone Warehouse and one of the Midlands most successful businessmen. DRET Summer Cup 2015 special guests Denise Lewis​, Gabby Logan​ & ex Scotland #Rugby Kenny Logan​. #DRET Summer Cup 2015 had 1500 students & special guests Denise Lewis​, Gabby Logan​ & ex Scotland #Rugby Kenny Logan​.